It has been a crazy week! I returned back to work after a week off for the holidays and came back to some major changes. Two of the three ministers I work directly under have felt God calling them to different places. So it looks like my last few weeks at work before maternity leave will be jam packed full of all kinds of preparations. Not only that, but the remaining minister I work for is expecting a baby in February as well. We are one busy department right now! But being busy is better than being bored, in my opinion. Our last doctor appointment went well. Baby Pippy weighed 2 pounds 3 ounces. She only gained 1 ounce in two weeks, but that’s okay. I’m hoping she will get closer to 3 pounds by the time she delivers, but we just have to wait and see. My doctor said I could eat 12,000 calories a day, but unfortunately because of her condition it won’t make her gain weight. So that’s another thing that is totally up to God. She’ll be as big as He wants her to be. They told me I have lots of extra amniotic fluid, which in a typical healthy pregnancy would be concerning. Apparently it can put you at higher risk for things like placental abruption. I asked my doctor if this was something that may happen in future pregnancies. Does my body just happen to produce more fluid? She said she thinks it is due to the baby’s condition. Perhaps she’s not taking in as much fluid as a healthy baby would. They are not overly concerned with it right now. So what does that mean for me? 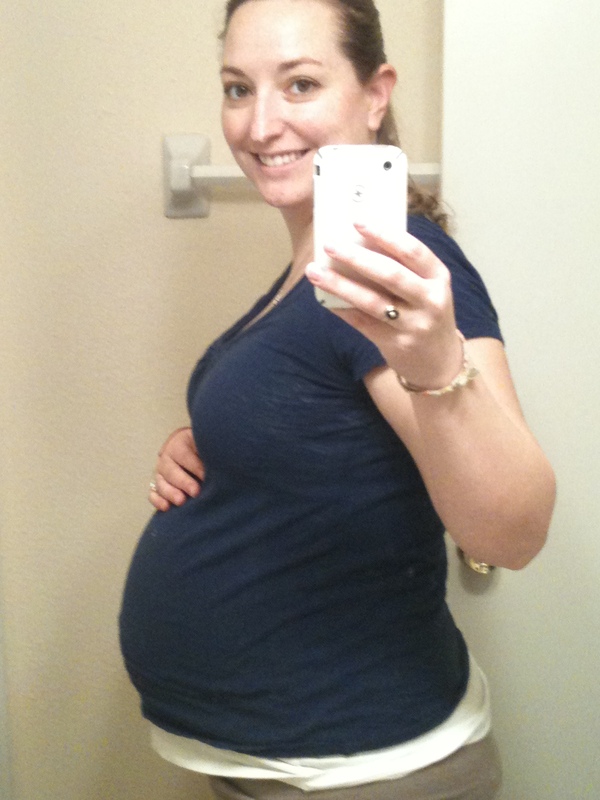 Well, basically, I get to look and feel like I’m 8 months pregnant, but I only have 2 pounds of baby in me. I’m choosing to look at this as a joy. 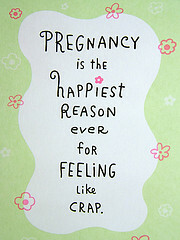 I’m getting to experience the same feelings that my other pregnant friends are experiencing. I get to compare belly size and not be sad that I’m so much smaller because my baby is so much smaller. People look at me and they know I’m pregnant. No one wonders. So thank you God for this most uncomfortable experience. My back hurts. I can barely bend over. When things fall on the floor, they stay there. Sleep is constantly interrupted by trips to the potty and repositioning of pillows and flipping from side to side. And I love it! Well, except for maybe the sleep part. We also got our first good glimpse at our little Epiphany Faith. The ultrasound tech did a 4D ultrasound to get a better look at her facial features and the cleft palate. Timmy and I decided we wanted to see. We decided the more we’re able to see now, the less shocked we’ll be when she is born. They pointed out the cleft to us and explained that her ears are lower set. I’m amazed at how God has changed me through this experience regarding physical deformities. Early on I was absolutely terrified. The first time we saw a tiny glimpse of the 4D ultrasound was several months ago and I cried to Tim as we drove home that I had barely looked at her. I felt terrible because I had allowed my fear to get in the way of looking at my baby’s face. This time I wasn’t scared. Not only that, I think she’s pretty darn cute! I can’t stop looking at her picture. I’ve been showing her off to everyone. The picture they sent us home with is a profile shot (so you can’t see the cleft straight on) and I’ve included it below. She is still breech. I’m not expecting her to turn. I think because she is so little and there is so much extra fluid for her to swim around in, she’s not feeling the urge to “get into position.” Plus I think the little stinker just wants to hang onto my ribs and keep her head closer to my heart. I’m okay with that. Well, except maybe the rib part….ouch! We are getting closer and closer to the day. Time refuses to stop. The seams holding me together are loosening. We are 3 weeks, 6 days away from seeing Baby Pippy face to face. I’m scared. I’m excited. I’m anxious to hold her and anxious to be able to move on. I cry when I think about saying goodbye and I smile when I picture her with our Lord and loved ones in Heaven. I am one proud Mama though! It is because of this sweet life that our lives are forever changed. She has brought her parents closer together. She has strengthened our love and trust for one another. She has brought us closer to God and strengthened our faith in Him in a way that we could have never done on our own. She has helped us to encourage and inspire others in a way that we could have never done on our own. Our lives will never be the same because of her. Whether she lives or dies, we are forever changed. I am grateful to God for allowing us to experience her. We continually pray for that last minute miracle of healing. But we will praise Him even if the healing doesn’t come because this child has done more for others, more for us, in the last 8 months inside my belly than some people do in 80 years walking around this earth. She is already amazing. Happily uncomfortable at 33 weeks. Previous Post Dates and Names and Tears. Oh My. Much Love! I’m so grateful to you. I can’t explain it, but thank you. She’s so beautiful! I love little babies! She is going to be perfect! Great picture! 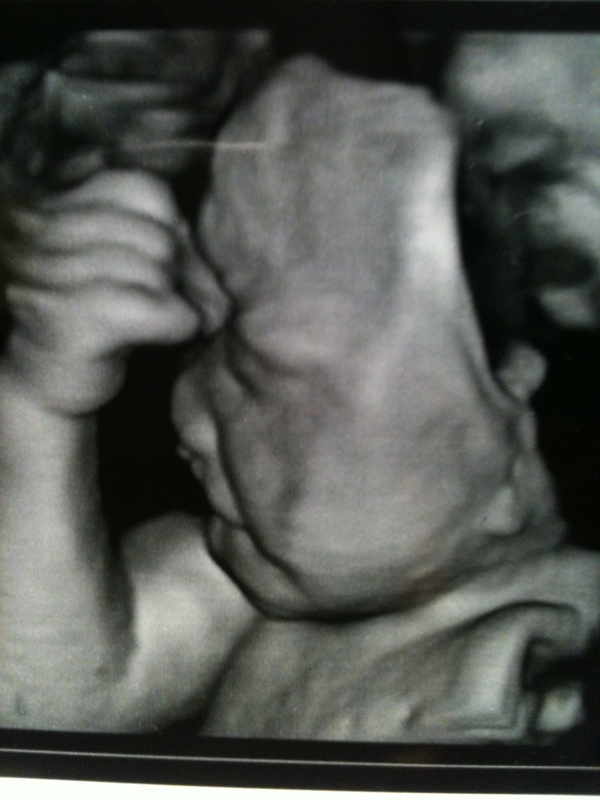 I love 4D ultrasounds. She is amazing, in so many ways. She is pretty darn cute…I must agree!!! Not knowing if we will get to meet her I have wondered if we would get to see her precious little self through ultrasound! Thank you for sharing the pic…those of us who love her can feel like we know her a little more now too! As always…amazed by the fruit of the Spirit in you and Tim. I know He is empowering you, but it is also a choice for you to walk this road with the joy and faith that you have. He speaks to my heart through your example continually! Love you!